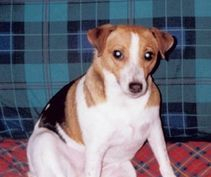 Lucy was a Jack Russell Terrier who gave her family, Keith, Rick, and their Doxie Ellie, 15 and a half years of unforgettable love and friendship. She loved playing with her baby sister Ellie and patiently waited at the door every day for her daddy to return home from work so she could give him sweet kisses. Lucy is missed dearly by her family, but is smiling down from doggie heaven!